The term “All Lives Matter” only applies when everyone is treated equally and no one is “ABOVE THE LAW”. 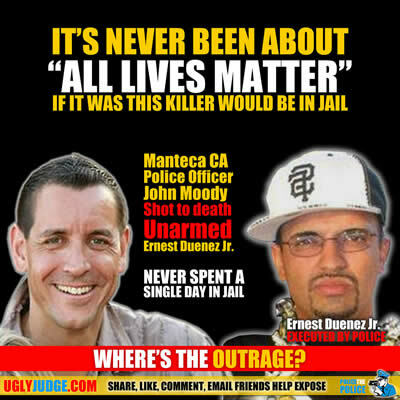 Which is really the case when someone in law enforcement is killed then all of a sudden its a major story. It’s made important and instantly they point fingers and someone is accused, jailed and prosecuted. Yet when police officers blatantly murder, abuse or commit crimes it’s rationalized. Acceptable? Please watch the video below of Officer John Moody lying in wait, then executing unarmed Ernest Duenez Jr. in front of his wife and home. How he handcuffs a mortally wounded man and fails to render aid. Then makes claims about a weapon that never existed all while in a position of safety. There never was any danger, no fear of anyone’s life or crime. Just a trigger happy officer who unloaded his weapon and never spent one day in jail.